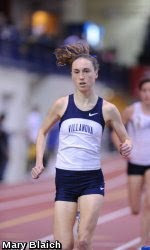 Bogdana Mimic joined Sheila Reid (3000 meters) and Matt Gibney (mile) as Villanova's only individual automatic qualifiers for the NCAA indoor championships by running 9:10.64 over 3000 meters at the Armory. Her time places her no. 7 on the NCAA Division 1 performance list heading into the championship meet in College Station, Texas on March 11-12. In the same race, Ali Smith ran 9:20.10 (33rd in the NCAA this season), good for fifth. The Villanova women have also qualified their NCAA #1 DMR squad, while the men await word today on the status of their 11th ranked DMR.